They say 'never meet your heroes', usually for fear of disappointment. 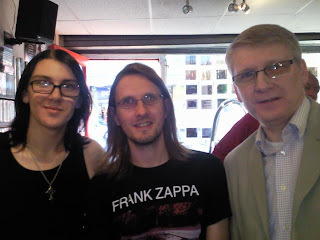 Well, today I broke that tabboo when I met Steven Wilson, the guitarist and guiding light behind the Progressive Rock group 'Porcupine Tree' (and many other excellent projects), and I have to say I was not dissapointed at all. He was doing a personal appearance at a local independent record shop, 'Record Collector' in Sheffield, just a few hundred yards from our house, to publicise his new solo project 'Grace for Drowning'. I was immediately struck by Steven's unassuming affability and total humility about his musical achievements. He was approachable, and interacted with his fans warmly, chatting and signing autographs with relaxed ease, from the same side of the counter as his admirers. He came across as a thoroughly nice bloke. The new album - a second solo effort following on from the 2009 offering 'Insurgentes' - is a great collection of music, reminiscent of his work with Porcupine Tree, with some at times soaring guitar work that in places reminds me of Pink Floyd and King Crimson at their height, but also making use of keyboards, drums, bass and woodwind. The mood flows from hard rock to quieter, more meditative passages, all with Wilson's signature 'groove'. A highly commendable album - as is everything the man does. Give it a listen, or even treat yourself and buy a copy.